The terms and conditions for a Catholic marriage are complex. This is reflected in the minimum six months notice required of a forthcoming marriage so that the couple may be properly prepared and the paperwork completed. Couples requesting the Sacrament of Matrimony are asked to contact Fr. John as soon as possible. At least six months notice is required. He answered, “Have you not read that the Creator from the beginning made them male and female and that he said: This is why a man leaves his father and mother and becomes attached to his wife, and the two become one flesh? They are no longer two, therefore, but one flesh. So then, what God has united, human beings must not divide.” (Matthew 19: 4-6). Since the time of the book of Genesis, God has felt that it is not right that man should be alone (2: 18), so he fashioned for Adam a helpmate, taking one of Adam’s ribs and clothing it in flesh which is why a man leaves his father and mother and becomes attached to his wife, and they become one flesh (2: 22-25) and (Catechism 1605). Although the imagery may be poetic, the fundamental truth remains – that the bringing together of a man and a woman in matrimony was and remains a divine action, blessed by God through the ministry of a priest or deacon on the behalf of the Bride of Christ, the Catholic Church. It is through marriage and the gift of children that the Church is built up and the faith in the Lord Jesus Christ is passed on from generation to generation. The option of a Marriage Service is available for couples who may wish it, the preferred medium for the exchange of marriage vows is the Mass because of the connection that all the Sacraments have with the Paschal mystery of the Lord Jesus Christ. It befits the importance of what the couple are celebrating in giving themselves to each other by sealing their consent through the uniting of the offering of their lives to the offering of the Lord Jesus Christ for his Church made present in the Eucharistic sacrifice and, if possible, by receiving the Body and Blood of the Lord so that they may form one body in the Lord Jesus Christ. (1621). 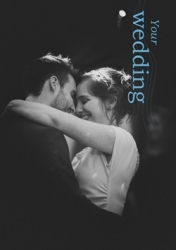 Your Wedding - a comprehensive guide to all aspects of a Catholic Wedding - available from the Parish Office.